You know what’s better than having a job with a flexible schedule? Having friends who have days off in the middle of the week. Yesterday, I met up with my old pal Culinary Mary and had a grand time in the Spa City. Not only that, but I experienced new things out the wazoo. Including a store that I never thought I would enter and a food I never thought I would buy. The breakfast date was set explicitly to check out the new morning offerings from TC Bakery Paris now that they have a cafe set up in the Grand Pavilion Hotel. It used to be that Mingle on the Avenue was serving breakfast to the hotel guests, but now breakfast falls on the shoulders of this counter. 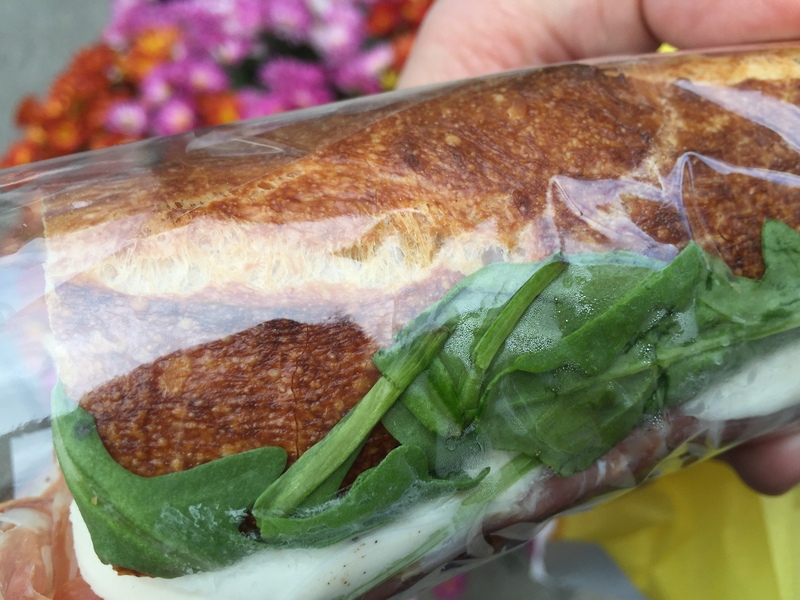 We tried the croissant with egg, cheese, and Niman Ranch’s European ham. That was a winner. And we also split a piece of opera cake, because how can you come to a patisserie and not have cake as part of breakfast? I was hoping for a financier, but I’ll have to wait on those. There were still macarons left in the case, and other treats, when we arrived around 10:30am. I know that some bagel lovers are excited that starting on Friday, TC Paris will be bringing in H&H bagels from NYC to serve at breakfast too. Whether that will be enough to entice people off Broadway is still an open question. So after breakfast Mary took me to the Saratoga Olive Oil Company. You may remember my disdain of their butter flavored olive oil. Really, I’d still like to see that product removed from the store’s shelves, but I was shown the varietal olive oil section, and am starting to warm up to the place. I especially enjoyed the Australian Hojiblanca and the Chilean Coratina. I’ve said this before and I’ll say it again, it really helps to go somewhere with someone who loves a place to get a better understanding of what makes it special. Speaking of special, after the olive oil tasting, I strolled past The Wine Bar and saw the new menu. Venison loin with chestnut bread pudding and a brussels sprout slaw? Oh my, that sounds amazing. I love how this screams fall. A half order would surely be plenty. Then I spied Saratoga Coffee Traders. Can you believe I’d never made it in there? Mostly it’s Matthew’s fault, because I would always want to see what he was roasting at Uncommon Grounds. But now that he’s moved on to Superior Merch, and I’m rooting for Death Wish Coffee in the small biz contest, I thought it might be nice to actually try a cup of it. Indeed SCT does sell this potent brew by the cup right there on Broadway. Ordering a large DWC seemed like a bad idea. So for just a couple of bucks, you got enough caffeine to make it through your day. Especially considering what it is, the coffee tasted good. It’s not going to win any awards on its aromas or flavors, but that’s not its goal. While that cup of coffee kept me going during midday, I also had a massive crash later in the evening. I’m not sure if that was just regular old exhaustion, or if that was some kind of unexpected caffeine withdrawal. My hope is it’s the former. Then I had a little business to take care of at Park Side East. It’s always good to see that place busy, but I was still too full from breakfast to consider eating a corned beef sandwich. Moments like these I wish that my capacity for food were greater. Getting older is definitely slowing me down. Culinary Mary made me promise to check out the Saratoga Tea & Honey company before I left town. My taste buds were shot from the coffee, so I didn’t do any sipping. But I did get a tour of the store, sniffed a bunch of teas, and learned a lot. One thing I learned was that they’ll brew up anything they stock in the store at their tea bar by the cup or by the pot. If only they had public wifi, I could see myself hanging out with tea and a laptop for hours. Still, I hope to make it back, perhaps with some stationary or a journal, and try some of those deeply aged teas at the bar. I did walk out with a bag of oolong, which I’m looking forward to brewing up. It had the most enchanting dried fruitiness when I smelled the sample vial in the store. The only thing I wasn’t so crazy about was how the prices of the different teas aren’t in clear view. They are printed on the bottom of the bags, but with so many teas, that makes it challenging to compare the relative value of their impressive selection. Now I was late, and had to get home. But I figured I should eat something quick before leaving town. So I popped into Mrs. London’s and got a ficelle sandwich to eat on the walk to the car. That was just about perfect. And that’s not a word I use lightly. The balance of flavors and textures couldn’t have been better. Salame finocchiona was thinly sliced and aromatic. The fresh mozzarella helped to mellow out the edges of the cured meat and gave the sandwich some body. The tenderness of the filling was juxtaposed with the crunchiness of the ficelle’s crust. There was just enough arugula to bring its peppery spice to the table without overwhelming. The whisper of balsamic brightened the flavors while helping to keep some of the fattiness in check, without stealing the thunder of the main ingredients. Damn. It was so good, I’m going to post its glamor shot. I’ve always avoided the sandwiches at Mrs. London’s so that I could have room for the shop’s pastries. But having already enjoyed one croissant that day, in the spirit of moderation I couldn’t bring myself to have another. Man, I’m glad I tried that. Seriously, that simple, cold, premade sandwich was one of the best things I’ve eaten in a long time. And I’ve eaten some pretty great things in the past couple of weeks. Brava. ← What Does Schenectady Taste Like? You missed Spa City Trifecta. I love Saratoga Tea and Honey! Did you happen to try the mango infused honey?? It’s lovely.